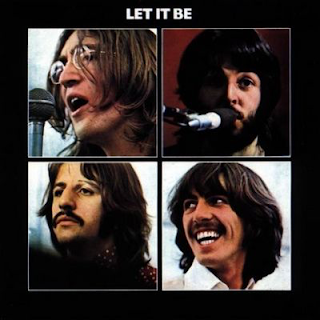 Recorded in some fractious sessions in 1969 before the "Abbey Road" album sessions, this was actually, in all but its chronological release date, The Beatles' penultimate album and it is generally accepted by most as being a patchy one, nowhere near as good as its predecessor, "The Beatles (The White Album)" or "Abbey Road". The negative feelings towards it do it a tiny bit of a disservice, however painful and chaotic its genesis. The holy thump of "Two Of Us" is lively and pleasant enough and the muscular, bluesy rock of "Dig A Pony" is, for me, as good as the rock stuff on the first side of "Abbey Road". I have never quite understood the opprobrium often thrown at "Across The Universe". I find it atmospheric and haunting. Give me that over "Rocky Raccoon" or "Martha My Dear" any day. 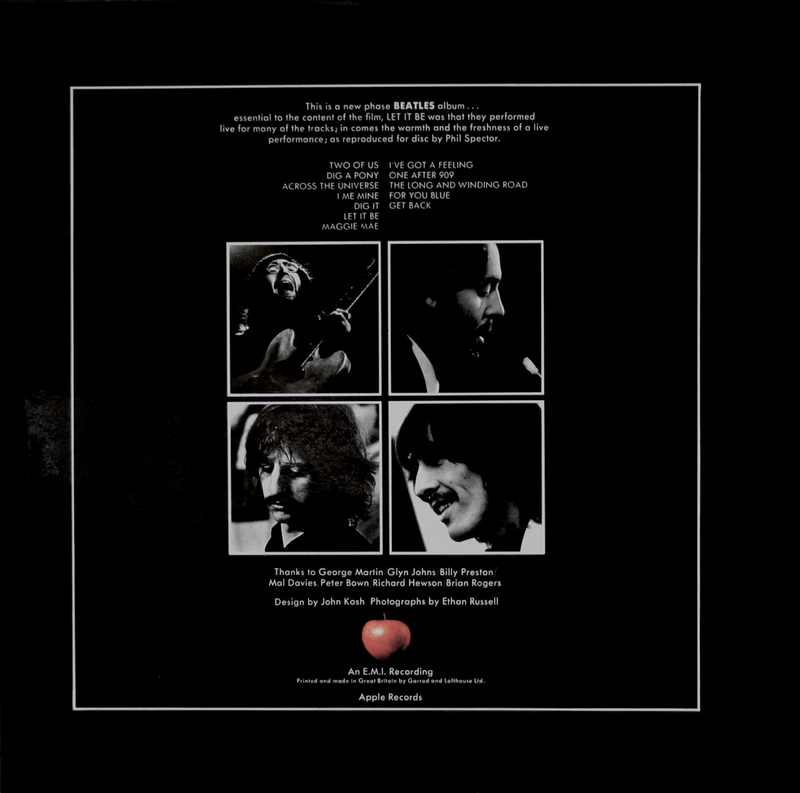 George Harrison's "I Me Mine" has some searing guitar on it and a catchy vocal from him too. A lot was made of the post-recording influence of Phil Spector, who put some strings on a few of the songs after The Beatles had recorded them. It was only really "The Long And Winding Road", "I Me Mine" and "Across The Universe" and, personally, I don't mind their presence. I feel his supposed negative effect has been over-exaggerated. I have always enjoyed the more raw, edgy cut of "Let It Be" used on this album, with its muscular guitar solo and infectious percussion. It is far more of a rock song on here as opposed to a maudlin hands in the air anthem. "Dig It" and "Maggie Mae" are both throwaway wastes of time, really. Paul McCartney's "I've Got A Feeling", from the legendary "rooftop concert" was another highly credible hard rocker with some serious guitar, excellent electric piano from Billy Preston and a convincing McCartney vocal, with Lennon chipping in with some vocals too. "One After 909" is another enjoyable country-blues/rock 'n' roll style rocker. 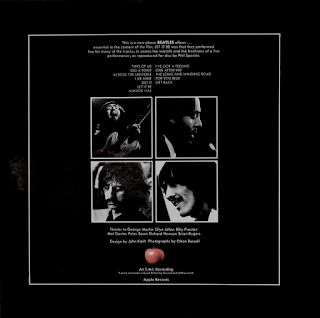 Yes, it is nothing special but in some ways, when one assesses The Beatles' credibility as a "rock band", something I have always had a problem with, this and most of the other material on this album is as rocking as they ever did. For me, I love the plaintiveness of "The Long And Winding Road" and, as I said earlier, I have no problem with the strings. They are beautiful, as is the song. I don't get the criticism of this song. It is a great one. McCartney still plays it in concert and everyone loves it. It would be in my top ten Beatles songs, so there you go. I like the brass orchestration it too. Harrison's country blues "For You Blue" is another good one, worthy of more than curt dismissal. Nobody can really argue with "Get Back" as a copper-bottomed rocker either, particularly the version that appears on this album. There is a perfectly valid case for this album being The Beatles best "rock" album. There is no McCartney "whimsy" present either, no twee "music hall" style "ditties", thank goodness. Add "Don't Let Me Down", "Old Brown Shoe" and "The Ballad Of John & Yoko" and you would have a pretty credible rock album. The wonders of digital technology allow you to do that and yes, it makes for a convincing album.